Not a full prenatal class. This is a hands-on session to practice coping strategies and to help you find practical tips for your labour and birth. Dress comfortably, bring a birth/pilates ball if you have one, a comfortable pillow, and a yoga mat or bath towel for your comfort. We will practice positions on the floor. Inspired by Lamaze, Bonapace, rebozo, yoga, visualization, cranial sacral therapy, and years of Doula experience. This class was designed as a compliment to our prenatal class (group or private). It is also a great refresher for those who have already taken a prenatal course, are having another baby, preparing for a VBAC (vaginal birth after cesarian), and is specifically designed for those wanting strategies to avoid pharmaceutical pain relief. Labour partners are encouraged to help support the birthing woman and to expect homework. Pregnant women who would like to come on their own are so welcome and invited to work directly with the facilitator / experienced Doula, Brandie Lekovic. Cost of class is $75. Infant massage is a natural way to nurture and care for your baby. We tend to do it while holding them - without even thinking about it. Infant Massage classes teach a full body massage routine, the benefits of individual strokes, ways to communicate with your baby, and to have some very special time together. The health-giving properties of Infant Massage include; growth and motor skill development, blood and lymph circulation, immune system stimulation, building bones, help with gas and colic, aid with deeper and longer sleep, emotional and physical bonding time. Facilitator, Brandie Lekovic, will lead you through individualized massage sessions. Sessions include massage oil and handouts. Classes are intended for babies who are pre-crawling and provide lots of clever hints on carrying massage into the years to come. Brandie received her training with the International Association of Infant Massage. Join a group class for $75 (4 sessions over 4 weeks). Private in-home sessions are available for your baby or a group of their new friends. $100 for a single session or $150 for 2 sessions which give a better chance for practice. Blessingways are gatherings where mothers-to-be can explore the challenges and possibilities of birthing and mothering in a safe and sacred environment. They reach deeper than a common baby shower to cherish a woman as she transitions. Being surrounded and upheld by the important women in our life can amplify a sense of strength, support, and trust in our instincts. A Blessingway is a gathering of women prepared to bless and nurture the mother-to-be. It is believed that Blessingways originated from the Native American tradition of offering blessings at various life passages. 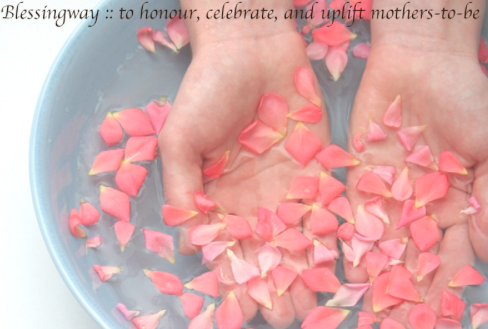 You can expect that a Blessingway sets a safe tone for the mother-to-be and her friends through some rituals (these led activities could include: mental preparation through hand washing in rose water; gathering in a circle; lighting a candle; offering words, items, or prayers for strength; releasing fears; preparing the mother with a foot bath, henna, or floral crown; and of course feasting together). To book an individualized, private session, contact us. Refund Policy: When cancelling a prenatal class after it has been booked there is a $25 (CAD) administration fee. If the cancellation occurs less than 14 days before the class there is a 50% cancellation fee. If it is less than 7 days there is no refund. Request for date changes within 7 days of class will reflect a $75 fee. Please keep this in mind when registering and plan to be finished your session by 35 weeks of pregnancy.